Dr. Amir Bahadori received bachelor's degrees in mechanical engineering with nuclear engineering option and mathematics from Kansas State University in 2008. He then attended graduate school at the University of Florida, studying medical physics and earning a master's degree in 2010. Bahadori was awarded a NASA Graduate Student Research Program fellowship in 2009, and in summer 2010, worked as an intern at NASA Johnson Space Center in the Radiation Health Officer Group. He accepted a full-time position as a NASA contractor in October 2010 and earned his Ph.D. degree from the University of Florida in December 2012. Bahadori transitioned to civil service in January 2013 with the Space Radiation Analysis Group at NASA Johnson Space Center. In his time as a NASA contractor and civil servant, he substantially upgraded the tools used to calculate astronaut risk from medical exams involving ionizing radiation, coordinated astronaut radiation risk reporting, led accelerator-based data collection, and served as principal scientist for the Advanced Exploration Systems RadWorks Radiation Environment Monitor project. In December 2015, Bahadori joined the Department of Mechanical and Nuclear Engineering as an assistant professor. 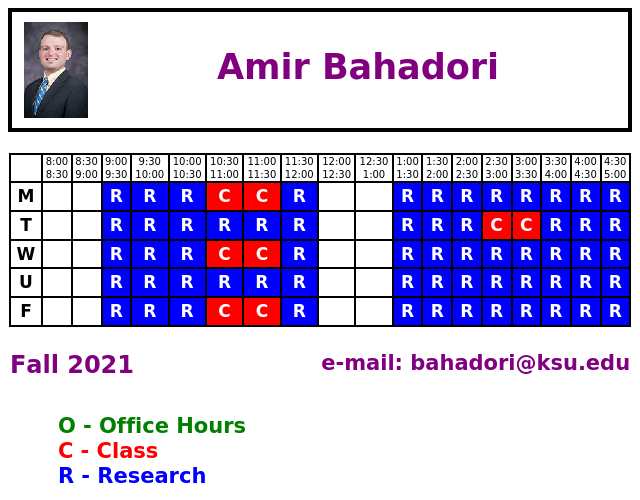 Bahadori is the Director of the Radiological Engineering Analysis Laboratory at K-State. His research is focused on the characterization of radiation environments and the response of the human system to radiation exposure using both experimental and computational techniques. Bahadori is collaborating with researchers in the Space Radiation Analysis Group at NASA Johnson Space Center on analysis of space radiation detector data and development of novel active shielding architectures to enable long-term exploration missions. He works on several Department of Energy-funded projects through the Plant Directed Research and Development program at the DOE National Security Campus in Kansas City, Missouri, on topics including X-ray dosimetry for electronic components and emergency response to nuclear and radiological threats. Bahadori is also interested in studying the characteristics of solar particle events, which result from extremely large releases of energy at the surface of the Sun, and in bio-mathematical modeling of radiation-induced cancer. Bahadori teaches courses related to nuclear engineering, including NE 690, Radiation Protection and Shielding and NE 648, Nuclear Reactor Laboratory. He has authored or co-authored 30 peer-reviewed publications and nine NASA technical papers, with 284 citations and an h-index of eight, according to Google Scholar. Bahadori has presented at numerous meetings in the U.S. and abroad, including the Workshop on Radiation Monitoring for the International Space Station, the American Association of Physicists in Medicine Annual Meeting, the American Nuclear Society Annual Meeting, and the Health Physics Society Annual Meeting. His research was featured in an October 2013 article on medicalphysicsweb. In 2015, Bahadori was honored to be part of a team receiving the NASA Group Achievement Award, and in 2018, he was awarded the Committee on Space Research (COSPAR) Zeldovich Medal by Scientific Commission F, Life Sciences as Related to Space. He is a member of the International Radiation Physics Society, the Health Physics Society, the American Nuclear Society, Alpha Nu Sigma, and Tau Beta Pi.